Free Speech For People has led the call for impeachment proceedings since Inauguration Day in 2017, due to the President’s direct and serious violations of two anti-corruption clauses of the Constitution from the moment he assumed the office. We have since expanded this campaign to include ten legal grounds for the US House of Representatives to start an impeachment investigation. making and directing illegal payments to influence the 2016 election. 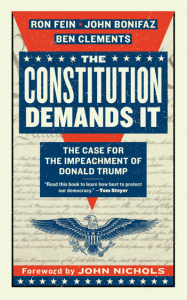 For detailed information on the first eight grounds for impeachment, check out our book, The Constitution Demands It: The Legal Case for the Impeachment of Donald Trump. The ninth and tenth grounds for impeachment were added following the the publication of The Constitution Demands It. More details about these grounds for impeachment may be found at the links above.